desk job. The shoulder can become injured in isolation or in conjunction with the arm, neck, back, or chest. 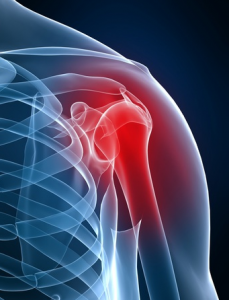 Shoulder pain can be caused by a variety of disorders, but the main cause is osteoarthritis. This form of arthritis results from wear-and-tear of the structures and erosion of joint cartilage. Another cause of shoulder pain is rheumatoid arthritis. This causes severe inflammation and swelling of the tendons and bursa sac around the shoulder. Torn cartilage and bone spurs also can cause shoulder pain. The rotator cuff is a structure formed of muscles and tendons. This complex structure supports the shoulder joint and allows for movement through a variety of motions. Tears to the tendon(s) or muscle(s) can produce shoulder pain. When the shoulder rotator cuff tear remains untreated, it can lead to a condition called frozen shoulder syndrome, which is associated with mobility problems. Viscosupplementation – For severe wearing of the joint, there is a loss of synovial fluid. The doctor can inject the joint with hyaluronic acid, which lubricates the joint so the bones slide easily against one another. Platelet-rich plasma (PRP) therapy – The Tempe orthopedic doctor can inject the joint with a solution of PRP. First, the blood is drawn and processed in the laboratory. After centrifuging the blood, the platelets are concentrated and purified in a solution. The PRP solution helps repair damaged joint structures. Cortisone injections – When the shoulder joint is inflamed, the doctor may inject with a corticosteroid agent. Because of side effects, cortisone injections are given several months apart. 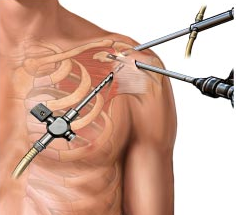 Shoulder arthroscopy – This procedure involves making small incisions around the joint, and inserting a tiny camera scope into the joint. Using tiny tools, the doctor can debride the joint, remove loose cartilage and bone, and make necessary repairs. This procedure is also used to see what structures are torn or damaged. Rest and ice – For minor injuries, the doctor may recommend resting the joint and using ice packs for pain relief. Rotator cuff repair surgery – If there are tendon tears of the rotator cuff, the Tempe shoulder specialist may repair the shoulder in surgery. This involves suturing and anchoring the tendon back together and to the bone. Medications – For chronic inflammation, ibuprofen, ketoprofen, and naproxen (NSAIDs) are used. For severe pain, the doctor may prescribe a narcotic analgesic, which is used short-term. Stem cell therapy – A new, innovative treatment option uses the patient’s own cells. The stem cells are obtained from the hip bone marrow, processed and purified in the laboratory, and then injected into the injured or damaged shoulder. Physical therapy – The orthopedic specialist may prescribe a course of physical therapy. The therapist uses exercises and special maneuvers to improve strength and function of the joint. Shoulder joint replacement – When the bone ends are frayed and damaged, and the arthritis is severe, the orthopedic surgeon can perform a shoulder joint replacement. The damaged bone ends and components are removed and replaced with artificial components.